Sanctuary is a unique 24-hour public art event exploring darkness, technology and place in the stunning landscape of the Galloway Forest Dark Skies Park. The event is a laboratory for off-grid creative experimentation in a remote setting and creates a space for participatory artworks that range from digital and sound works to radio transmissions, video and performance and experimental labs, lectures and open conversations. We have opportunities for 4 young people aged 18 – 25 from Dumfries and Galloway to work on this years event. Sanctuary happens over 24 hours Noon September 23rd – Noon September 24th. Interns must be available for September 22nd – 25th and be happy to camp at the event. An Internship is simply a period of work experience and skills development offered by an employer to give young people exposure to a working environment which relates to their interests. We pay a stipend (fixed fee) to interns and cover travel and food on work days. 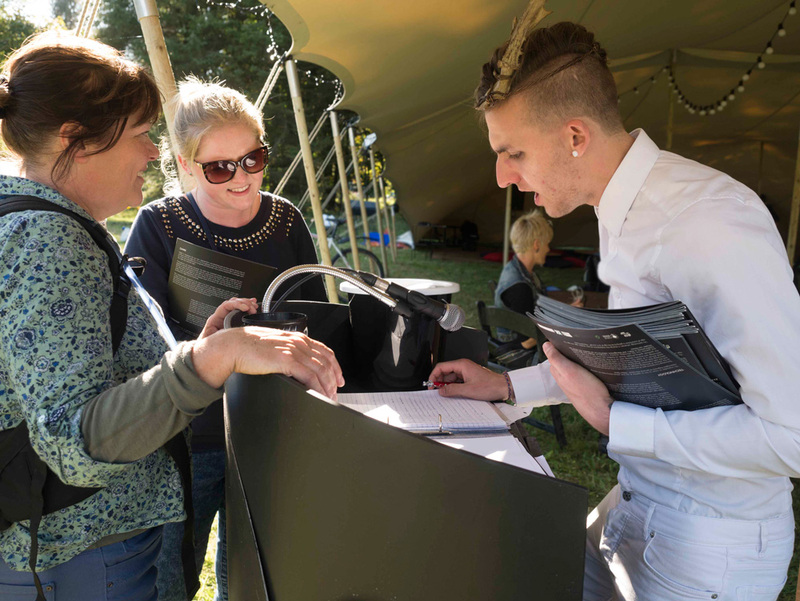 From liaising with artists to site logistics, event management is all about organisational and people skills, can you help coordinate all elements to produce a successful and safely run event? Sanctuary is a fun and friendly event and we like our volunteers to add to the atmosphere. You’ll help recruit volunteers and make sure they know their role and are in the right place at the right time at the event. This is a sociable internship; connecting and communicating with enthusiasm and helping to build a team are key parts of the role. You’ll also help design and make the decor for the site – signs, flags, lights e.t.c and help our Volunteer and Decor Co-ordinator to organise a weekend for volunteers where the site decor is made. The Sanctuary team build all structures and shelters for the event onsite. We use amazing stretch tents that provide venues for the artists and audience. Working with our experienced site managers, you will learn how to put up event structures safely and securely. There will be initial training at the Nithraid in Dumfries on 8th/9th September and 2 site visits to the Dark Skies Park will be required to learn about site planning. You must be happy to work outdoors. You should enjoy meeting people, be flexible, have good time keeping skills and enjoy being part of a team. It would be helpful to have some knowledge of the particular field you are interested in. You will offer us your time over the period of the run up to the event and over the event itself. (You may be required to work on some tasks at home) In return you will learn and gain new skills through experience and mentoring from a member of our team. It is envisaged that interns will start work in mid August at the latest and will continue for a couple of weeks after the event is finished to ensure wrap up and evaluation processes are complete. Additional time/effort will probably be required in the week preceding the festival and over the festival weekend itself. You will get a stipend (£600 for Event Management and Volunteer Development/ Site Decor Interns. £300 for Infrastructure Interns – less time input is required) and we can pay for your travel and subsistence. The Event Management and Volunteer Development posts will be based in Moniaive. If you are from a different part of the region, you must be prepared to travel. We can offer local accommodation if public transport is difficult to avoid loads of long bus journeys. We may sometimes book office space in Dumfries to meet depending on where interns come from. The infrastructure posts will involve training days in Dumfries and site visits to the Dark Skies Park ( 7 miles from Newton Stewart) as well as working at the event. Please note that we can only accept applications from young people who are based within Dumfries & Galloway. We are asking interested people to contact us no later than 7th August. all you need to do is email Rebecca hellosanctuarylab@gmail.com with 250 words or less – a little bit about yourself, why you want to be an intern and confirming that you are available to be an intern. (Please let us know if there are any times during August and September when you will not be available) If we think you are a good match for the posts, you will be contacted shortly afterwards and arrange to meet you for an informal chat.